I told my husband that I wanted to make him a special dessert and what would he like to have, he said, ummm, I would really love to have that thing you know that is a cake and it is really a pie, and oh I want ice cream on it. Do you ever get answers like that from your family and friends, you gotta love it! After a bit of thinking I came back to him and told him I would be making him a Cherry Pecan Dump Cake and did that sound like the one he wanted, he said yes that's it, that's the one! So here it is, fresh out of the oven with a big dip of ice cream to top it off, and it is delicious! There is just something about the old classic's that bring back good memories and great comfort. In a 9 X 13 baking dish pour in the cherry pie filling and the crushed pineapple, then stir together until completely mixed. Very gently sprinkle the cake mix on top of the fruit, keeping it as even as possible. Sprinkle the chopped pecans over the top of the cake mix. Place the tiny ice cold butter cubes all over the top of the cake mix and pecans. Remove the cake and let cool on a cooling rack for 20 minutes before serving. Top with ice cream to garnish. This Cake Won't Last Long, It Looks So Good! Oh My Goodness I Can't Wait For A Bite! I Saved This Serving Just For YOU!! 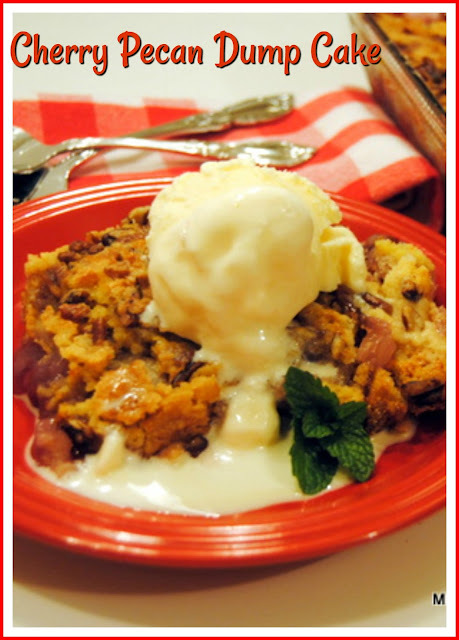 I sure am glad that you were able to stop by and have some of this delicious Cherry Pecan Dump Cake with us today. Hope you have a great week and come back to see us real soon! I have made this, Miz Helen, and it is sooooo good and easy! Thank you for the reminder, and for Leonard's request!! Can you believe I've never made a dump cake? I really need to change that! I love the way Leonard described this dessert, Miz Helen! My husband sometimes does that sort of thing as well. 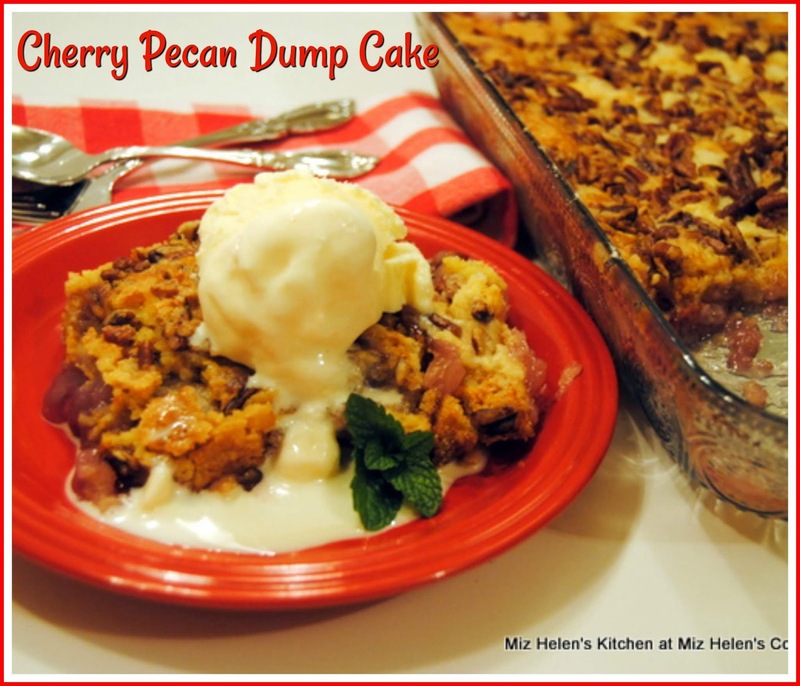 Your Cherry Pecan Dump Cake looks so delicious - what a lovely combination of flavours. Sharing on the Hearth and Soul Facebook page tomorrow. Thank you for your support of The Hearth and Soul Link Party! Happy Valentine's Day! This sounds and looks so rich and delicious! Thanks for sharing at the What's for Dinner party. Can't wait to see what you'll bring this week!